I’m getting a lot of practice making bread lately (once a week), and it’s really paying off. I guess practice does make "perfect." There was a time when all my bread turned out the same, boring and even, but no more. It may be confidence, or a so-what-if-I-fail attitude, or perhaps even tarragon... but something has changed. I’m getting pretty good results. 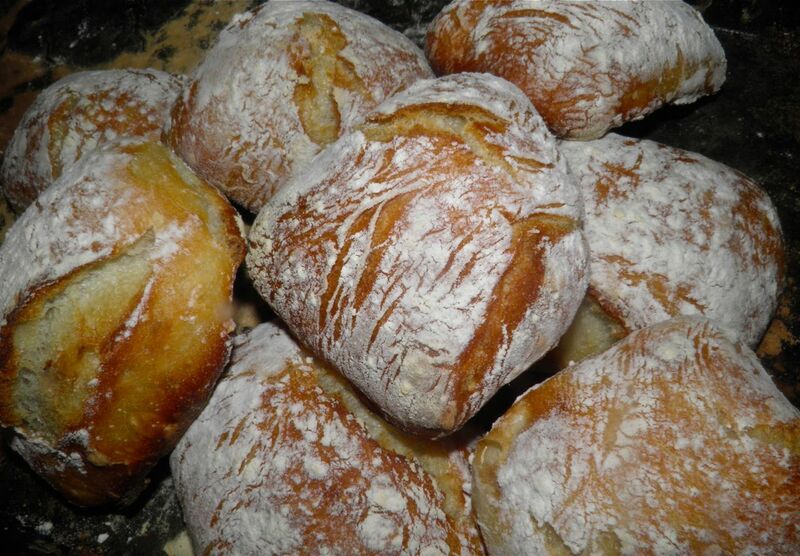 This recipe is a revisit to one of my initial forays into bread on this blog, ciabatta bread. Don’t look it up. I’m a bit ashamed. It’s like looking at very early Julia Child episodes on PBS. You see, they’re square, so they’re “special,” and therefore a target for me. Ciabatta dough is highly unusual. It's extremely wet, with nearly the same amount of water and flour. This makes for a very loose dough. If you make regular white bread you would be shocked. 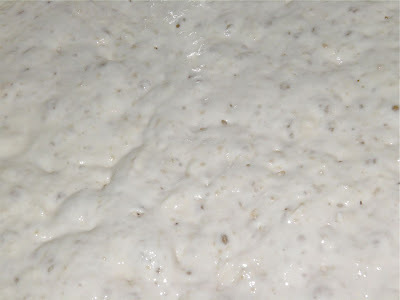 Left: the dough when just mixed. At right: after 12 hours. Significant rising and the dough is very loose. 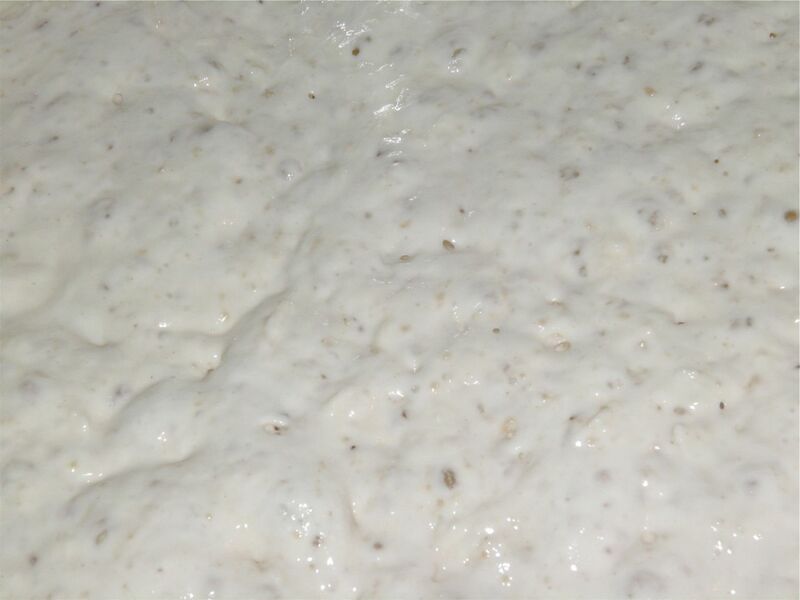 This is the surface of the dough. If yours looks like this, you're on the right track. This is the dough. It kind of plops out onto the board. But you CAN work it. Fold the dough over with your dough scraper until it starts to obey you. Then flatten and cut. My rectangles of dough were then "pushed" into squares. Believe me when I say it’s impossible to knead in any traditional way and the look of it will strike fear into the heart of any baker that isn’t expecting this sort of dough. It looks like abject failure. Traditionally, the dough was slapped on a floured counter or folded over itself. Since I’m a little short on counter slapping space I opted for using a dough scraper to coax the dough up and over itself. It works. And the result? A crusty exterior and a chewy, moist interior. Wow. And as Julia would say: Bon appetit! Convince the cut pieces of dough they want to be squares. The day before you want to bake mix all the ingredients together in a bowl. The mixture will be very wet. Cover with plastic wrap and a dish towel. Let rise for 12 hours. At the end of the 12 hours, scoop the dough out of the bowl and place on a very well floured surface. the dough will be full of air bubbles and very, very loose. Sprinkle the top of the dough lightly with flour. 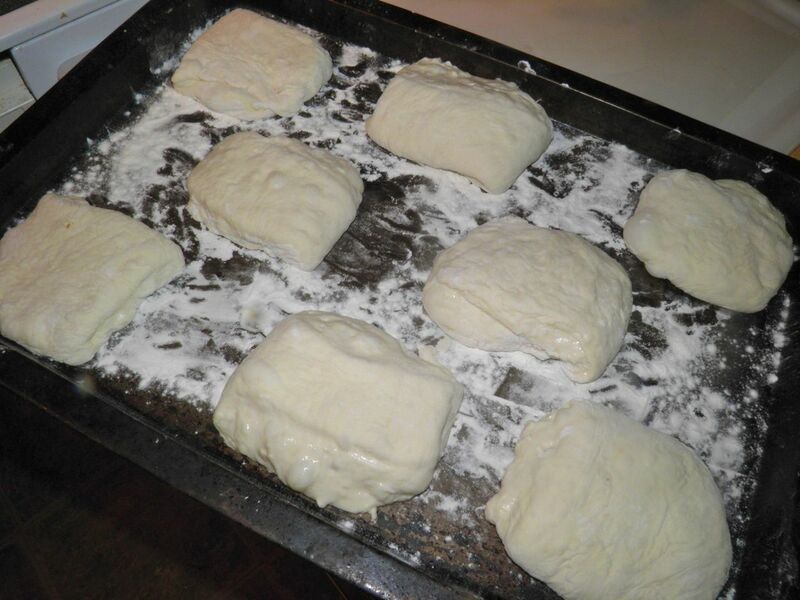 Using a dough scraper, fold the dough up over itself until it becomes somewhat less sticky, about 2 minutes. It will still be very loose and look almost impossible to deal with. Pat the dough out – with a well-floured hand – to a square about 14” x 14.” Use the dough scraper to cut the square into eight even pieces. Place each cut square onto a well floured (or parchment lined) baking sheet. This will be difficult. Try to reform the dough on the baking sheet back out to roughly square shape. Let the cut rolls rest for one hour in a warm spot. 20 minutes before the resting period is over, preheat the oven to 450°F with a pan of water on the bottom rack. Bake the rested dough in the hydrated oven for 10 minutes. Remove the water pan and continue baking for a further 20 minutes. The rolls will be puffed and brown. Let cool slightly (or completely) before serving. Ciabatta slipper bread is awesome.